Voila! Wales-based start-up Viola Black wants to hit the right notes with the launch of its account and prepaid card. That said, its advertising campaign (see image) did say “Move over, Monzo”. So it’s looking to steal some of the UK challenger bank’s thunder. Viola Black offers the usual money management app features – such as tracking day-to-day budgeting, send funds overseas and digitally store receipts. 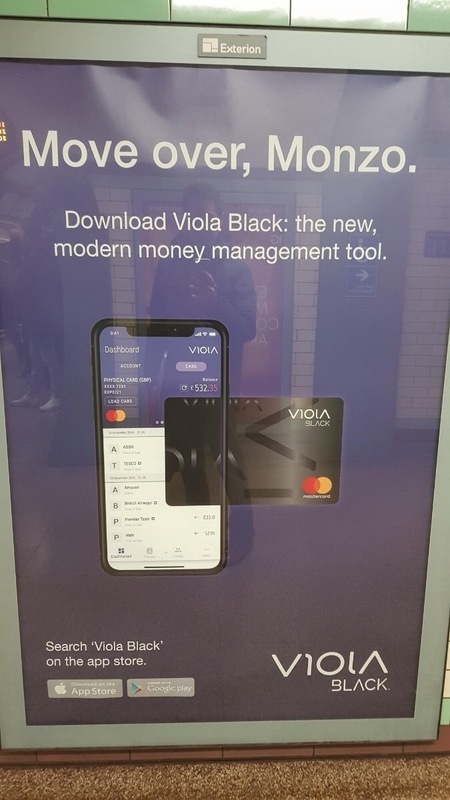 According to the company, it will never link a user’s bank details with the Viola Black card. It charges a monthly fee of £4 for using the account – “simply because we don’t want to be the kind of company that loses money and folds”. It is part of the Viola Group, a privately held company that was first established in Vienna in 2012. Now it has offices in the UK, US, Dubai, and India, with planned expansion into Brazil, Canada, South Africa and Australia. Also in the group is ViolaCard. This has a separate website and offers a prepaid debit card for money transfers, currencies, and money management. The card is issued by AF Payments. Viola Group should not be confused with the Israel-based private equity firm of the same name. The latter was founded in 2000. As reported in December 2017, that Israeli group closed $100 million toward a target of $120-$150 million for its new global fintech fund.